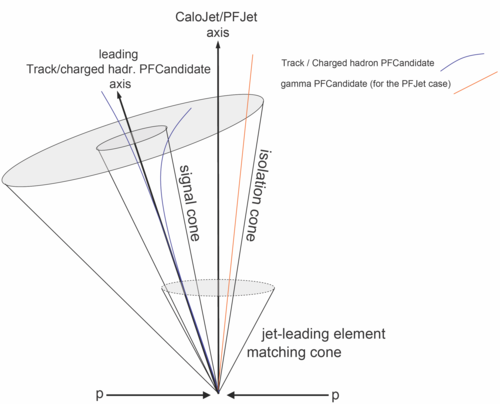 The goal of this page is to document the usage and creation of hadronic tau-jet candidates from ParticleFlow jets. How to get latest & greatest tau ID ? 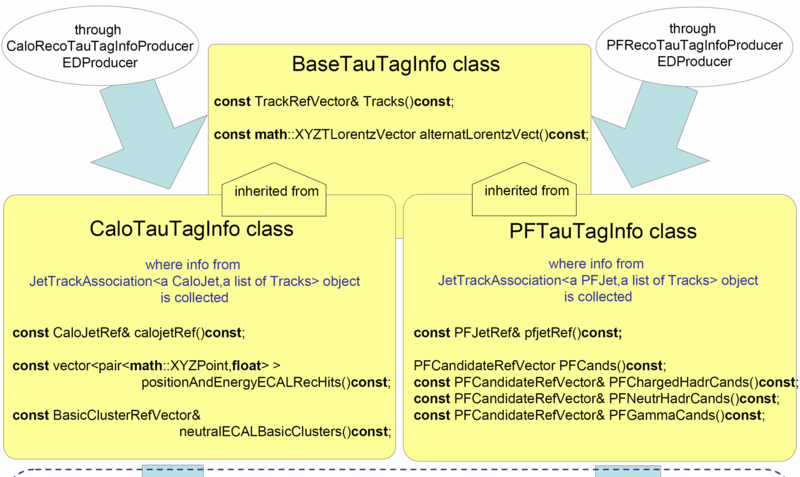 The minimal recommended tags for tau reconstruction can be found below. If you want to use on top, the analysis tools (PAT) please check the recommended tags here SWGuidePATRecipes. A dedicated analysis package for Ztautau, Wtaunu and HiggsTauTau studies can be found here SWGuideTauAnalysis. The recommended working points by the Tau POG can be found in TauIDRecommendation, TauIDRecommendation13TeV. Check the section on discriminators below to understand their proper usage. The tau collections contained in the simulated samples are often outdated. 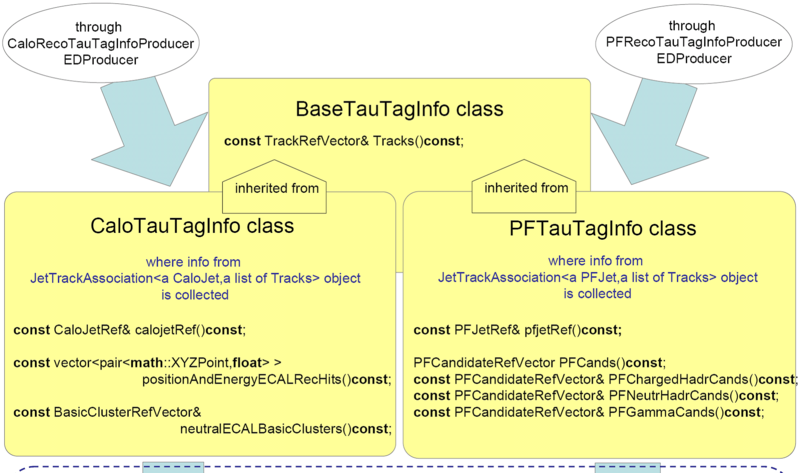 The most recent tau ID is in general contained in the releases, so to benefit from all new features and bugfixes, you should re-run the PFTau sequence on RECO/AOD. Because the the most up-to-date software is almost always contained in the production releases, there is no need to merge in any code from other repositories. When running in un-scheduled mode it is enough to add process.load("RecoTauTag.Configuration.RecoPFTauTag_cff") to the config file. Note that the backport branch of choice depends on the CMSSW version that you are using. The -u is necessary to avoid that git checks out all packages that depend on any of the ones touched in this branch since this would lead to a very long compilation. Then compile everything. 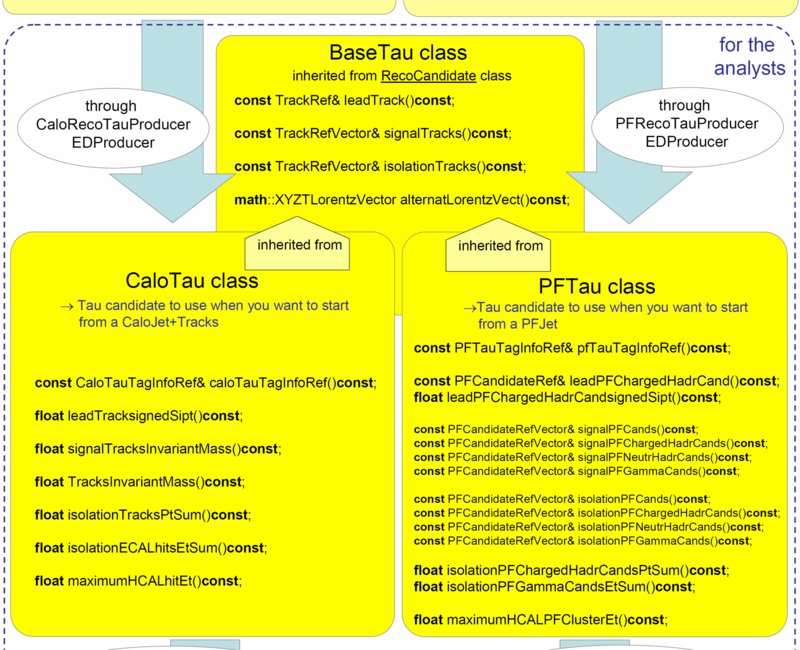 From the example you can see, how to embed the new discriminators into a re-created pat::Tau collection. FROm that point on you can access the new discriminators as usual from their names as parts of the new pat::Tau object. In case you want to re-run the the anti-electron MVA6 discriminator from miniAOD event content, you might face the problem, that one low level varibale, the phi angle at the ECAL entrance is not saved in the miniAOD. In this case you can bypass this flaw by recalculating it on-the-fly, by track extrapolation. For this purpose in the configuration of the discriminator set the parameter usePhiAtEcalEntranceExtrapolation to True. Below, a code example for including the new training with old decay modes w/ embedding into a new pat::Tau collection is shown. The procedure is the same for the training with new decay modes. Please refer to the TauIDRecommendation13TeV TWiki for the lines that need to be changed. # this sequence has to be included in your cms.Path() before your analyzer which accesses the new variables is called. The python configuration to be added to include new trainings of the anti-electron discriminator is shown below. Please be mindful that if you want to include new isolation and anti-electron discriminators at the same time, things like the PATTauIDEmbedder need only be run once. Just reorder/change the example python configuration snippets accordingly. While it is not possible to fully rebuild taus from jets given MiniAOD event content, it is possible to recompute the BDT output of the isolation discriminators for new trainings done with the 2017 simulations v1. In order to be able to access the latest and greatest BDT output for the isolation discriminators and save it in your ntuples, you need to add a sequence to your python config file and some code to your analyzer. The recipe is similar to the one for CMSSW 8_0_X, with the exception that the discriminator payload needs to be loaded in the python config file. For those who prefer to stick to the 2016 manner of tau MVA inclusion a code example for including the recent old decay mode 2017v1 and dR=0.3 2017v2 trainings w/ embedding into a new pat::Tau collection is shown below. To access the 2017v2 one has to replace "v1" by "v2". Please refer to the TauIDRecommendation13TeV TWiki for the lines that need to be changed. While it is not possible to fully rebuild taus from PF particles with MiniAOD event content, it is possible to (re)calculate tau-Id variables with both "classic" BDT-based algorithms as well as with new experimental deep-neural-network-based (DNN-based) ones. This section provides a recipe on how to get those tau-Ids. Note: also "classic" MVAIso 2017v1/v2 can be added with the runTauIdMVA.py tool discussed below. 1. Setup CMSSW area. DNN-based tau ids are available in the follwing CMSSW releases 9_4_X (where X >= 13), 10_2_X (where X >= 9), and any release >= 10_4_0. Note 1: Do not forget either store the updatedTauName collection to output file or read it in your ntuplizer. The simplest way is to run the cmsDriver command for MiniAOD production (starting from AOD or whatever), with release where the desired implementation was introduced (or later version). For example, the latest implementations such as anti-e MVA, MVA isolation, removal of 3prong + pi0 etc are introduced with 7_4_12 (MiniAODv2 with 74X) or 7_6_2 (MiniAODv2 with 76X). As long as you just read RelVals global tag is not very important as you do not read any conditions, so you can safely use automatic one, i.e. auto:run2_mc. By running the configuration file, you can get the MiniAOD with latest greatest tauID. Guidelines for Tau POG developers can be found on the following TWiki page: SWGuidePFTauIDDevelopers. The legacy tau ID has been present until CMSSW_7_1_0_pre1. Since CMSSW_7_1_0_pre2 it has been superseded by the new tau ID for Run II (see below). The legacy tau ID has been present until CMSSW_7_0_0_pre12. Since CMSSW_7_0_0_pre13 it has been superseded by the new tau ID for Run II (see below). The legacy tau ID software contains several discriminants introduced in the end of 2012 and in 2013 that were not run during the official simulation and data reconstruction (see Full list of recommended discriminants . and add process.recoTauClassicHPSSequence to your path. Please, have a look at TauIDRecommendation to see recommendations on how to use the new discriminants. If you wish to add new PAT features, please follow the recipes on PAT SW guide. Use only the recipes for the git transition and newer (on the top of the page). This recipe has been tested to work on release CMSSW_5_3_11_patch6 and it is possible that some merging problems might appear in older releases. Write to hn-cms-tauid@cernNOSPAMPLEASE.ch in case of any troubles. The new dynamic strip reconstruction is included by default in CMSSW_7_4_14. Use this or higher versions of CMSSW to reconstruct taus with dynamic strip reconstruction. Also included is the SWGuideBoostedTauID, please click the link for more details. Please switch to MiniAOD samples produced with CMSSW_8_0_10 as soon as they are ready. Use this or higher versions of CMSSW to reconstruct taus with dynamic strip reconstruction. This version is superseded by 76X for 2015 analysis. The new dynamic strip reconstruction is included by default in CMSSW_7_4_14. Use this or higher versions of CMSSW to reconstruct taus with dynamic strip reconstruction. Please switch to MiniAOD samples produced with CMSSW_7_4_14 as soon as they are ready. The 2014 tau ID is present since the first pre-release. The 72x is the current development release, so if you want to profit from continuous tau developments, use the latest available pre-release and re-run the tau ID. This software branch does not contain yet the implementation of tau reconstruction in subjets and analyses in this release are not supported by the tau POG. The 2014 tau algorithm is not supported in CMSSW_6_1_X series. MVA anti-mu discriminator: This is a new discriminator against muons. According to MC it reduces the mu -> tau fake-rate by a factor 3-4 compared to the anti-mu3 discriminator (for the same efficiency). The MVA anti-mu discriminator is however not validated with data yet. MVA tau ID discriminators: These come in 2 variants, including ("wLT") and not including ("woLT") tau transverse impact parameter and decay vertex information as MVA input variables, in addition to isolation Pt sums. There exists two sets of discriminators, trained on 1-prong and 3-prong tau candidates ("oldDM") and trained on 1-prong, "2-prong" and 3-prong tau candidates ("newDM"). Please, do not use CMSSW_5_3_X_boostedTaus branch for any further developments. It has been deprecated and will be archived soon. git checkout -t remotes/tau-pog/CMSSW_5_3_X_tauID2014 # make a new local branch called CMSSW_5_3_X_tauID2014 that pulls from and pushes to ("tracks") CMSSW_5_3_X_tauID2014 branch in cms-tau-pog repository. When you are happy with local developments (using git add/rm and git commit), the command git push will directly update CMSSW_5_3_X_tauID2014 branch in cms-tau-pog repository. The recommended tau ID algorithm is based on ParticleFlow and is called HPS). RecoTauTag/RecoTau - Implementation of the discriminators and decay mode finder. On RECO level reco::PFTaus are used to store all possible taus jets. The result of the various discriminators is stored in reco::PFTauDiscriminator . 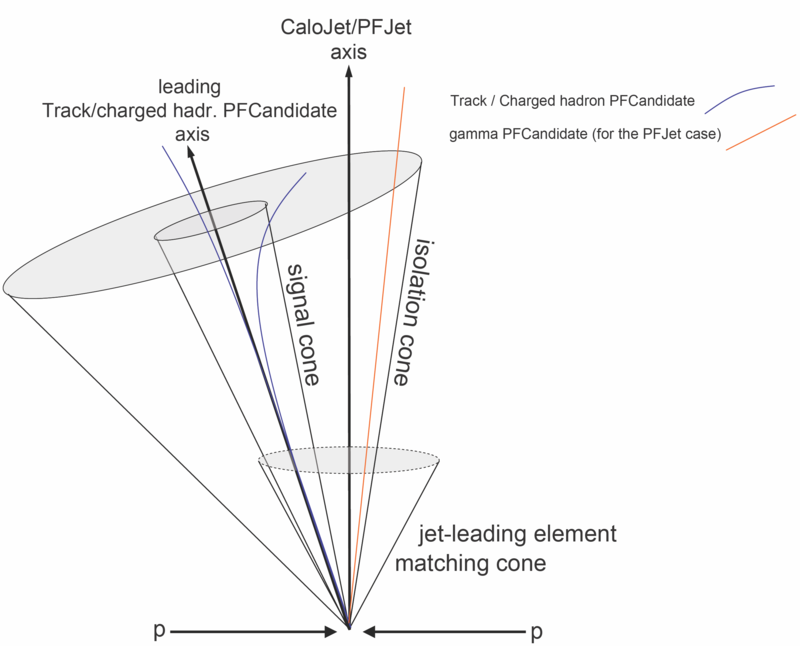 The initial PFTaus collection will first contain one tau candidate for each reconstructed PFJet (using the anti-kt algorithm with a cone size of 0.5). The jet direction is set to the direction of the leading charged hadron in the jet (highest pT), which should be within ∆R = 0.1 with respect to the jet axis. In this stage the signal- and isolation cones as well as the decay mode are defined. Subsequently the various algorithms create PFTauDiscriminators which can be used to select a collection of PFTaus. The PFTauDiscriminators are used store the result of the various tau tagging algorithms and select jets that likely originate from a hadronic tau decay. By definition they are real numbers between 0 and 1 where higher numbers indicate a more positive outcome of the discriminator. Note that most discriminators are in fact binary thus taking just values of 0 (=did not pass) and 1 (=passed). Loosening of quality cuts on tracks of isolation candidates means that more of them can enter isolation pt. This results in slightly decreased efficiency of tau identification but also considerably decreased jet fake rate. More details in this talk . The combined isolation is recommended for all taus, while MVA based isolation can provide better performance for low pt (< 100 GeV) taus. Since RecoTauTag /RecoTau V01-04-23 (V01-04-23-4XX-00 for 4XX analysis) a new training for MVA isolation is available. The discriminators have "IsolationMVA2" in their name. The new MVA training provides working points with decreased electron fake rate when keeping the same efficiency as for previous training. All MVA3 discriminators veto tau candidates in a crack region between barrel and endcap, so they are NOT RECOMMENDED if you are using tau id for TAU VETO in your analysis.